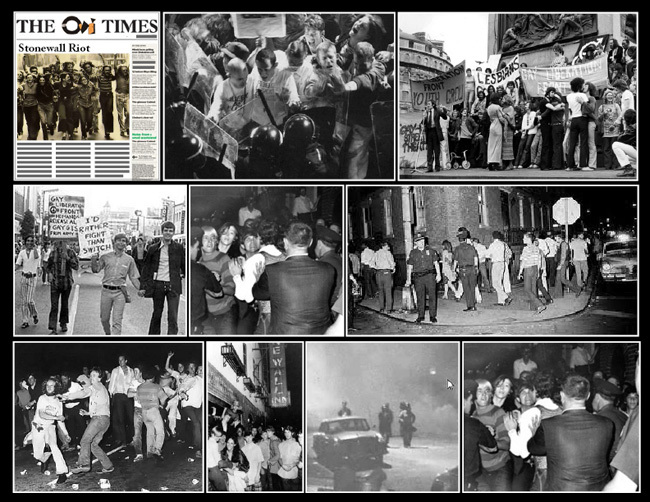 June 28th 1969; just after 3 a.m., a police raid of the Stonewall Inn - a gay club located on New York City's Christopher Street - turns violent as patrons and local sympathizers begin rioting against the police. Although the police were legally justified in raiding the club, which was serving liquor without a license among other violations, New York's gay community had grown weary of the police department targeting gay clubs, a majority of which had already been closed. The crowd on the street watched quietly as Stonewall's employees were arrested, but when three drag queens and a lesbian were forced into the paddy wagon, the crowd began throwing bottles at the police. The officers were forced to take shelter inside the establishment, and two policemen were slightly injured before reinforcements arrived to disperse the mob. The protest, however, spilled over into the neighboring streets, and order was not restored until the deployment of New York's riot police. The so-called Stonewall Riot was followed by several days of demonstrations in New York and was the impetus for the formation of the Gay Liberation Front as well as other gay, lesbian, and bisexual civil rights organizations. It is also regarded by many as history's first major protest on behalf of equal rights for homosexuals.